Does anyone else get excited when the time comes for your kids to learn the alphabet? I love when my kids are learning their letters and sounds because that means they are building a foundation for learning to read! 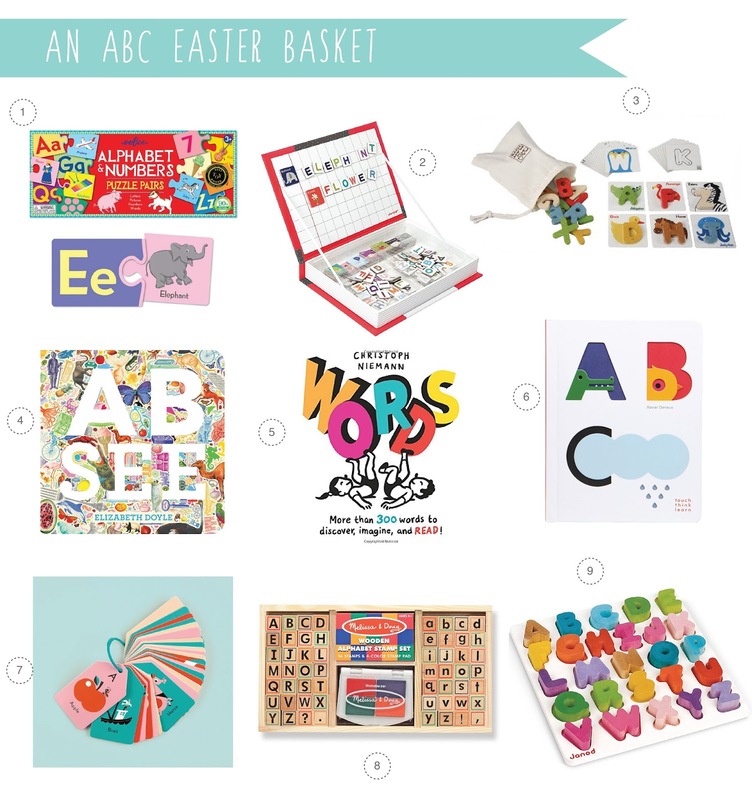 We've put together some of our top pick for little learners on this Easter basket round up and are now having a difficult time settling on what exactly to put in our kids baskets. So many cute options! 1. eeBoo Alphabet & Numbers Puzzle Pairs - putting things in pairs can be so satisfying, we love these eeBoo puzzle pairs because they are high quality, colorful, and fun! 2. Janod Alphabet Magnetibook-a toy that improves fine motor skills and encourages spelling out words, yes. This portable set includes illustrated pictures along with 104 letter tiles to encourage letter and word recognition. 3. Plan Toys Preschool Alphabet- I bought this Alphabet set for my oldest who is 8 1/2 and it is still in amazing shape. My toddler loves playing with the letters and matching them to the corresponding images on the cards. While I love that in addition to its durability, it comes with a drawstring bag to keep everything together. 4. AB See by Elizabeth Doyle- visual eye candy as well as educational, sign us up! Elizabeth Doyle has created a stunning and engaging book that showcases each letter as a compilation of tiny images that begin with that letter. A wonderful take on an eye spy- a must for any toddler library. 5. Words by Christoph Riemann- this clever book pairs 300 sight words with illustrations that encourage kids to delve into word meanings, explore how they are used and more. Perfect for the beginning reader in your house. 6. ABC Touch Think Learn by Xavier Deneux- this has been my go to gift for baby showers and first birthdays lately and has been met with universal adoration. The design is superb and the die cuts invite children to learn through tactile as well as visual exploration. 7. Mudpuppy ABC Flash Cards- so many flash cards, so little time. There really are an amazing array of beautifully designed flash cards available these days, but we picked this set because it is not only well designed but includes a ring to keep all those lovely cards in one place. 8. Melissa & Doug Alphabet Stamp Set- my kids are stamp fanatics, especially my 3 year old. If there is a stamp set available he is there. This alphabet set is a fun way to start a discussion on letters and would be a great way to practice spelling words, if you are looking to liven up study time! 9. Janod Alphabet Puzzle- this puzzle is gorgeous, wooden and colorful and begging to be displayed as well as played with. It fits so many of the criteria (educational, durable, long lasting) we use for buying toys that it's a no brainer.